We asked Elré to tell us a little more about the history of her wedding gown and we quickly realized it was a tale of sadness, beauty and charity. Elré on her wedding day in 2011. Elré went to see fashion designer Shani Swanepoel in Potchefstroom – a bubbly person from what we understand. Her dress was inspired by a friends’ dress a few years prior. Shanis’ creative talents helped Elré to turn a conceptional idea into a dream gown. 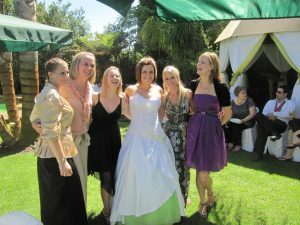 On the very hot summers’ morning of 10 March 2011 Elré got married at Rusticana, Paarl. 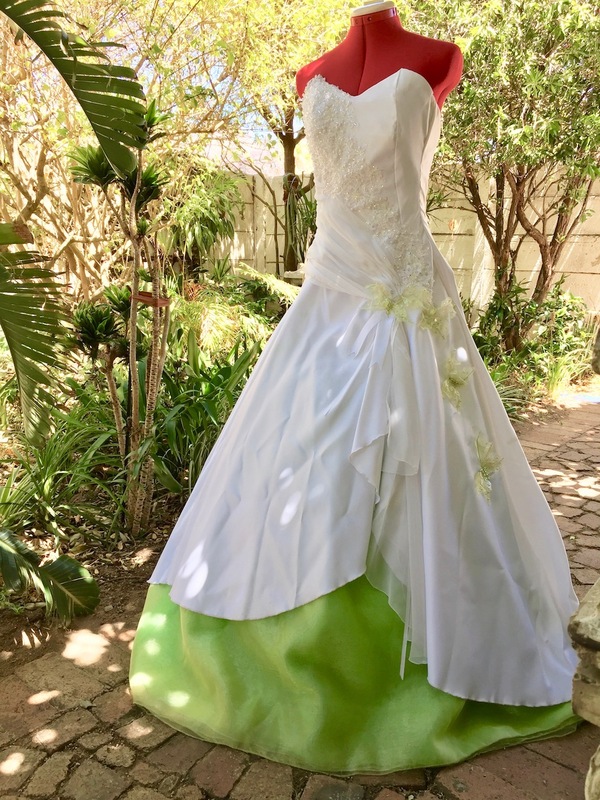 At the time Elré was living in Potchefstroom and the dress traveled all the way to the Western Cape as the wedding was here. From there the dress went along for the Honeymoon all the way up the East Coast and back to Potchefstroom. At this point I must tell you, this dress seems to have a tip or two on travelling! Sadly not all fairy tale weddings have happy endings and a few years later the marriage was over. 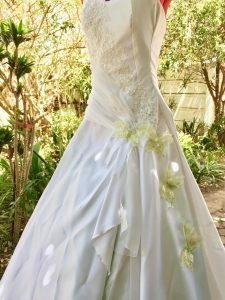 At this point the wedding gown made its way back to the Western Cape – I told you, this dress loves to travel! At this point the future of this dress held a lot of potential and possible destruction. Options included the popular theme of ‘Trash-the-Dress” photoshoot, and we are thankful that did not happen. It was suggested the dress be donated as a Matric farewell dress, but didn’t feel right to Elré. She tried to sell it, but no interest. Then she tried to donate it to a lady that helps brides in need, but at the time there was not a need for such help either. Beautiful butterfly detail compliments the dress. Just because all fairy tales don’t end with moonshine and roses, does not mean a princess can’t have a happy ending. Eventually Elré met her real prince Charming with his suit of armour, fortunately not a creature wearing tinfoil. Last year October he heard about TAGI on one of our radio broadcasts and immediately told her about us. After careful consideration she decided to donate her dress to us and put some good back into this world. And here the travels begin once more?! I’m telling you people, this dress is a travelling girl! At this time Elré was living in Malmesbury and passed the dress on to her parents. Then her parents passed it on to friends of theirs living in Strand. And it was here where I collected the dress on the afternoon of 12 February 2018. A word from Elré herself; “I am VERY happy with where my dress ended up and it makes my heart warm to know that it will be used to comfort and make something so sad – beautiful”. Thank you Elré for sharing so much with us, and for donating your wedding gown to us. Together we will help grieving families in the worst of times.